I don’t collect money except for a few odds and ends but I found this bank-note interesting. I found it in a local antique mall and paid $7.00 for it. 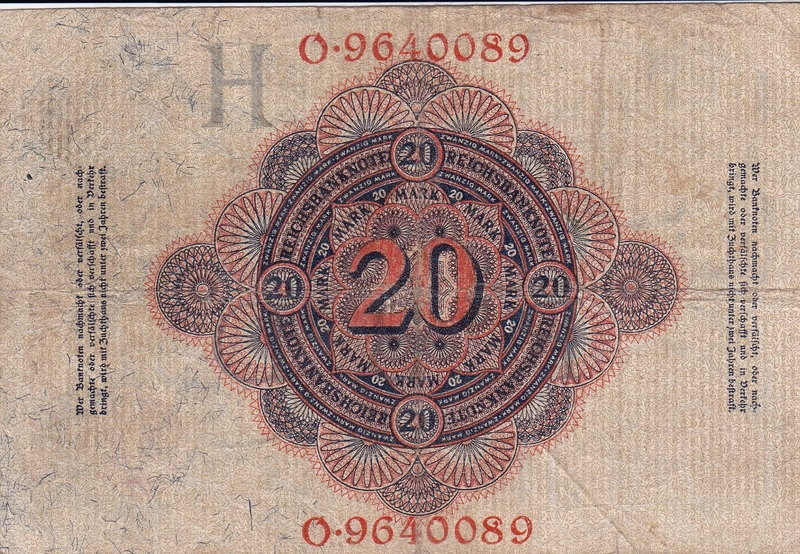 It’s a 20 Mark note (about $4.00 US dollars in 1914) from Imperial Germany dated February, 1914, about 6 months before the start of World War One. What caught my eye was the lettering and how artistic the note is over all. 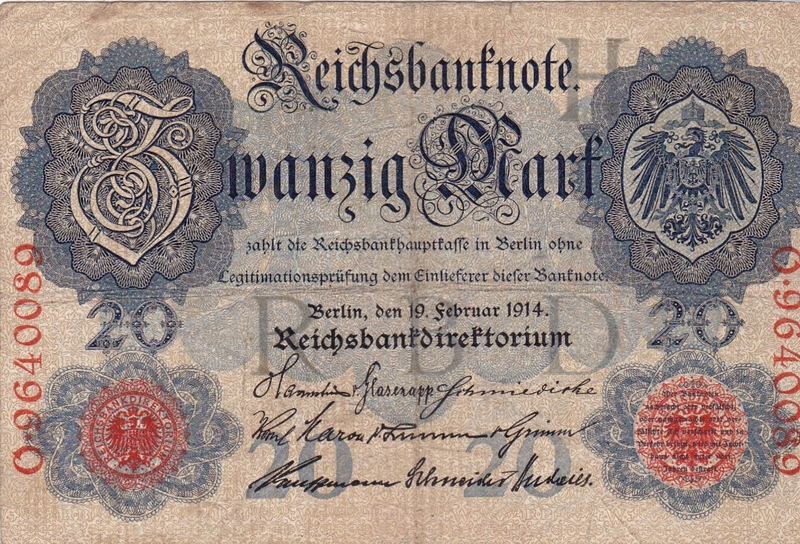 From a historical point of view it represents a stable, strong currency that steadily would lose value throughout the war but most importantly after the Treat of Versailles when Germany was forced to pay huge war reparations-a factor that led to the Second World War. 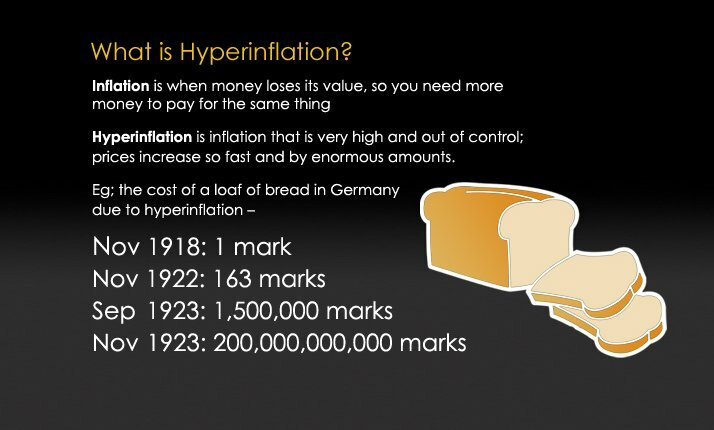 Other countries have experienced hyper-inflation worse than this but not many! By 1923 one US dollar was worth 4,200,000,000,000 German Marks. That’s over four trillion! It partially explains the Nazi rise to power that focused on nationalism (German pride) and the harsh, punitive reparations Germany was forced to pay. They did have pretty currency, at that. The design and the colors are quite ornate. The quality of the paper feel rather fragile, however, when compared to the American dollar of today. But perhaps that is to be expected of money nearly 100 years old! Yes, yours is dated June, 1919, about 7 months after the war. Still great artwork and lettering but hyper-inflation just around the corner for the mark.How did you come by this note? A relative’s co-worker gave it to me and I’m not quite certain where he got it. It may have been from his relative. It’s a little brittle around the creases but in a little bit better condition than the one pictured in that link. Interesting. I wonder how these notes made their way here. By 1914 the waves of German immigrants in the earlier years was over but it’s not impossible that new immigrants did not cash in all their notes from the fatherland. The one I bought is in great shape but it was also pressed in a clear plastic envelope kind of thing and probably not exposed to heat. I wonder what the memorabilia will be like 100 year or so after the next hyperinflation. Some sort of digital art, no doubt! I have a collection of reichmark art. I love the beautiful artwork. To me, these are priceless small works of art. I couldn’t part with them for less than a million dollars! I love just studying the artwork and wondering what hands these passed through. One is of a beautiful big warship. I found all of mine in the back of an old bible in my attic when I was a kid. Yes, that could be a hobby all in itself. Any idea what warship it is? Thanks for stopping by and leaving a comment.